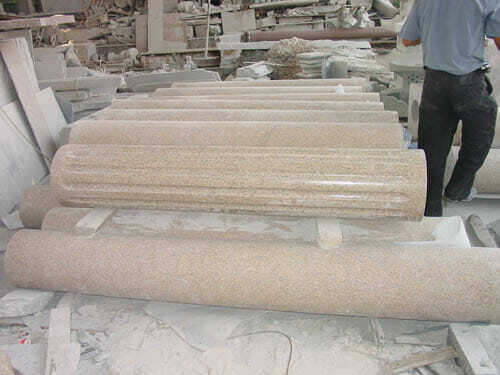 Perhaps more than any other architectural detail, natural stone columns strongly represent classical style and elegance. Its no surprise that they are often found on museums, courthouses, city buildings, banks, colleges, and mansions as a symbol of grandeur and prosperity. If you are planning out the design of your new luxury home, commercial building, or institution why cut corners and go with wood, vinyl, concrete, faux stone, or stucco columns to support your exterior and Interior balconies? 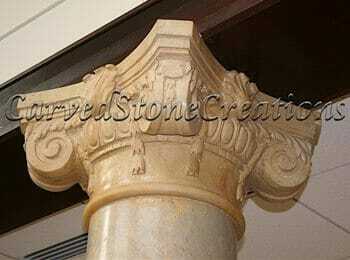 Give your home a look of timeless beauty with natural stone columns. Carved stone creations has designed and installed countless natural stone columns with classic Corinthian, Doric, Ionic, and Tuscan Order designs. Our artisan carvers can capture fantastic detail in stone with these traditional styles. The capitals they carve are faithful to the classic Greek and Italian design motifs they are meant to represent. One thing you wont find on the majority of our columns is seams! 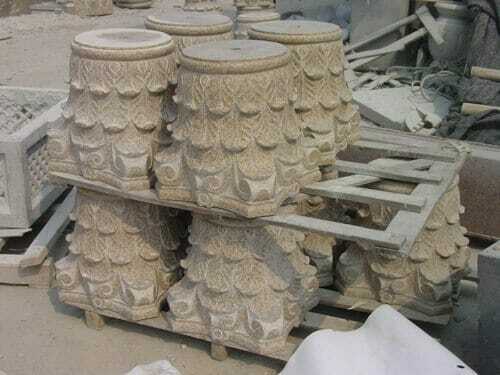 Unless the height of the column is unusually tall our column shafts are carved from a single block of stone with separate capitals and bases adhered with epoxy during the installation process. We can also core the center of our columns out to allow them to include a steel beam structural support or to reduce the weight of the columns. However this will require the column to be made in segments. If weight is a significant concern we can even use ¾ stone cladding over another structural support to give you the appearance of natural stone columns at a fraction of the weight. Please keep in mind that this will also require seams as well. 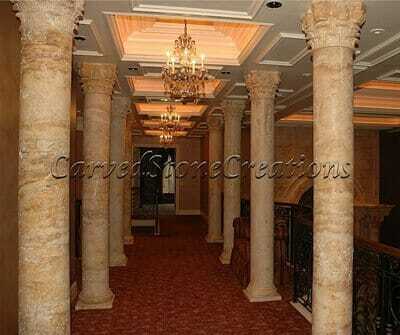 We can design columns for you in any diameter or height you desire. 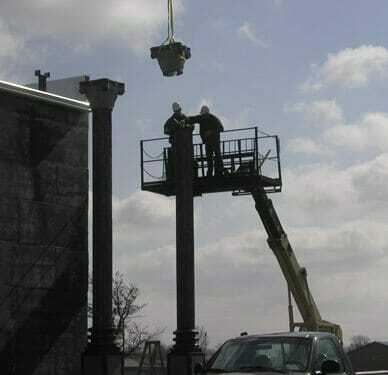 We also have all of the necessary equipment to install them outside or inside your home or business. 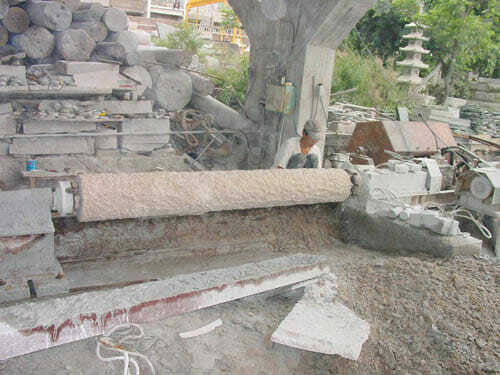 Let’s take a look at how our expert stone carvers make a column. 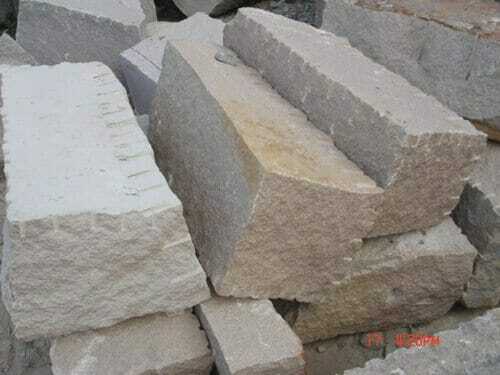 Our carvers start with a solid stone block cut to rough dimensions. Next the block is attached to a lathe and turned until it is cut down to the desired shape and thickness. The shaft is honed to a smooth finish and polished if desired. The bases are carved as separate parts. The capitals are hand carved as separate pieces as well. Now that you have a better understanding of how our columns are designed and made, take a look at some installed examples. We designed and installed these Golden Orient Travertine columns to span the walkway in the foyer of this beautiful home. 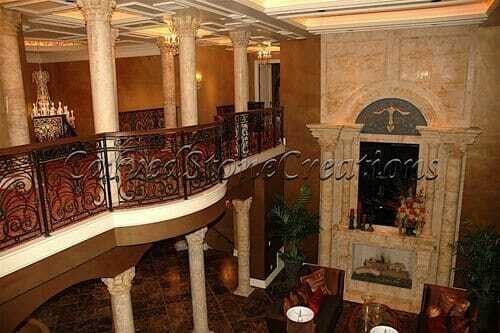 Columns can also be used in a more decorative manner in the interior of a home. Here we the columns we installed create a wonderful compliment to the arched doorways of this home. 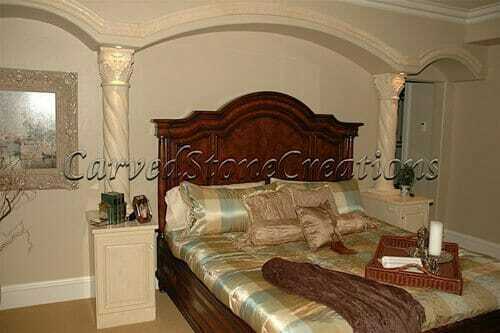 These half columns and archways frame the wall in this master bedroom beautifully. We also installed the stone trim you see on the arches. 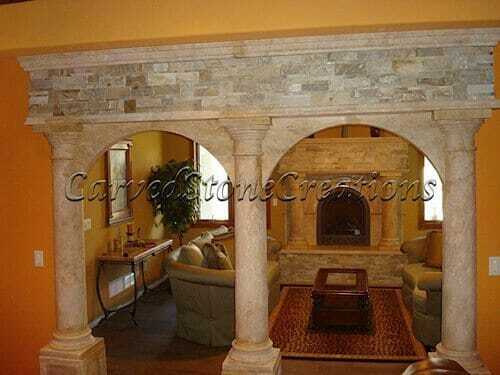 This unique stone archway incorporated columns and brick veneer above it to match the fireplace in the living room. 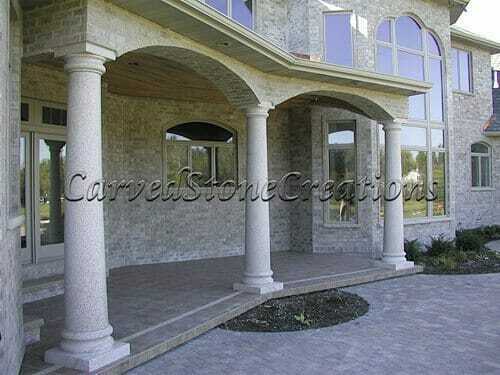 Of course we have done a wide variety of exterior columns as well. 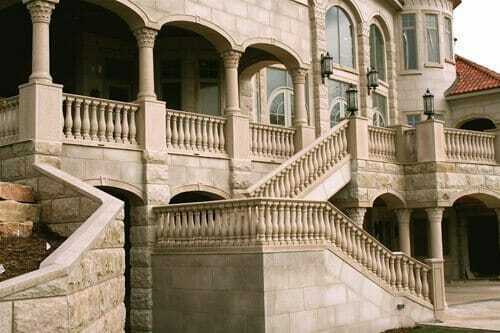 Combining columns with stone balustrades and stone veneer makes for a really elegant exterior balcony. So how do we install them? Lets take a look at the process a little bit closer. 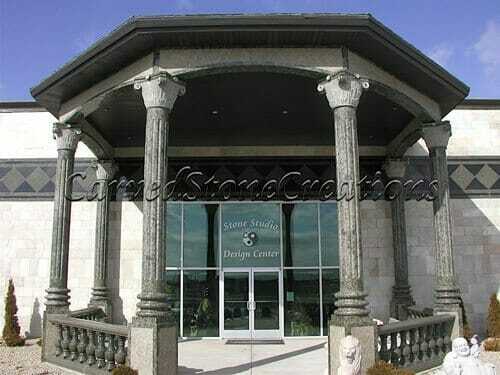 The entryway for our showroom features towering 2 story Galaxy Green Marble columns. Due to the height, we had to use 2 pieces for the shafts. Here you can see the steel rods in the joints which add additional structural support. Hoisting the bottom of the shaft up. Setting the top half of the column. Setting the capitals into place. 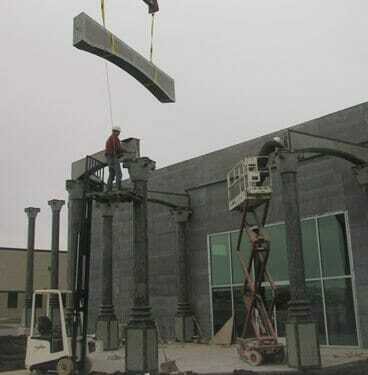 Hoisting the arch slabs into place. From there we added the roof and the balustrade railing at the base. What about interior columns? 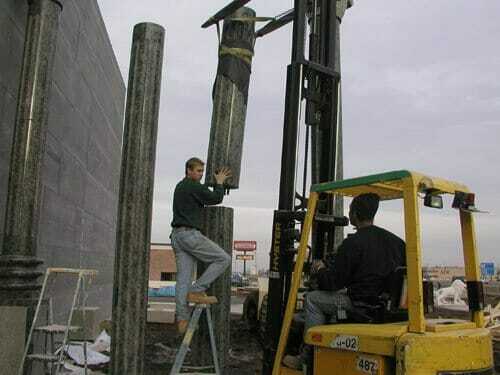 Its not as easy to do when you cant use a crane or forklift to position columns! Years of experience have allowed us to come up with an efficient custom installation method. 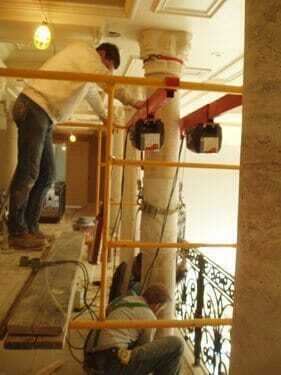 Using scaffolding and a dual electric winch setup we slowly raise the column up as we roll the scaffolding backward. Here we are carefully checking our placement before we proceed with installation. Once the column is raised we make adjustments with the winches until there is enough clearance for the base to slide in beneath the suspended column. Next we slide the base beneath it and epoxy everything in place. This particular installation required steel support beams to be inserted in the center of the columns so we cut the columns in half vertically and joined them together around the beam as you may have noticed in the pictures. Once the seam is filled with grout and the column is sealed and treated with a color enhancer you can barely notice the seam. Heres the finished result. 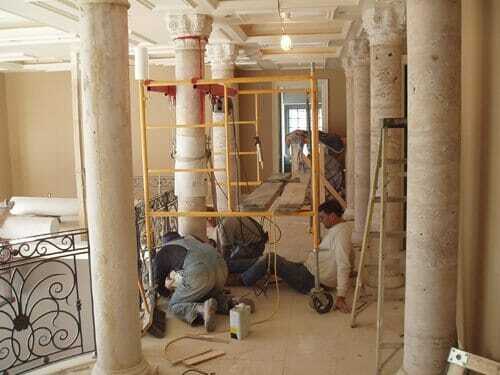 Interested in adding columns to your home, business, or institutional building? 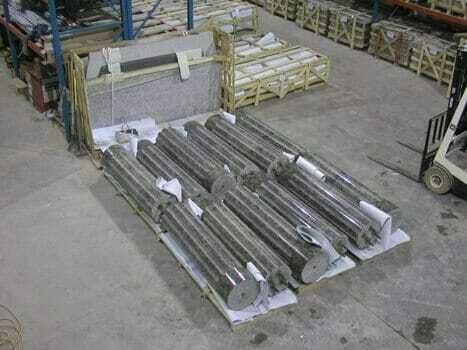 We have a variety of columns in stock that can be ordered from our online store. 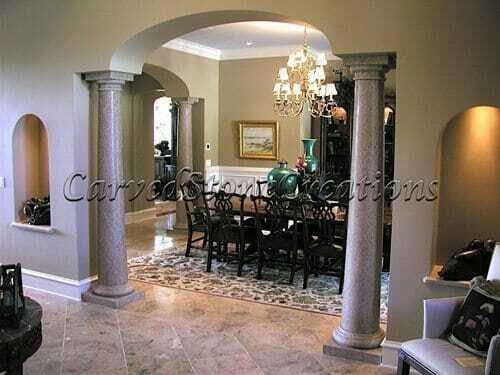 We can also custom design columns to fit your specific needs. Contact us today to see what we can do for you. 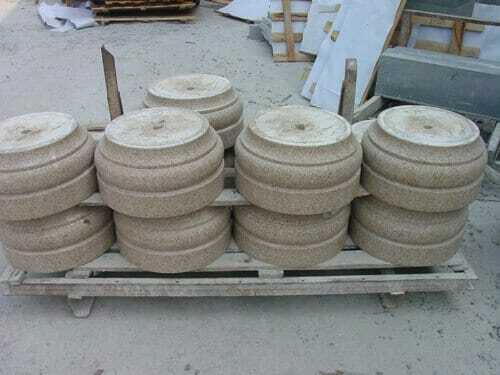 Carved Stone Creations is located in Kaukauna, WI and we are a reasonable drive away from many Midwest metro areas including Milwaukee, Madison, Chicago, Indianapolis, Fort Wayne, Minneapolis, St. Paul, Grand Rapids, Ann Arbor, Traverse City, Davenport, Des Moines, St. Louis, Kansas City, Cincinnati, Columbus, etc. Visit our showroom to see first hand what we can design for you. Our convenient centralized location also means we can bring all of the tools and heavy equipment we need to tackle any installation job. Outside of the Midwest? We can install there too. We have done work from New York to Florida to California as well.